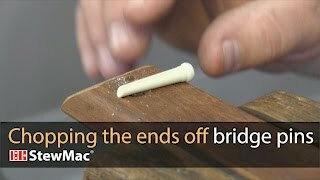 High quality old-style lathe-turned bridge pins in genuine bone. All pins have a 5-degree taper. Slotted pins have a 0.070" (1.78mm) string slot. These are beautifully made pins, however they require extensive hand sanding to fit Martin HD-28. Once they finally fit, they are awesome. They definitely enhance the clarity of the sound. These bridge pins are not only beautiful, but seem to resonate just a bit better than the original ebony pins in a very nice Taylor. I'm ordering more. I ordered these Waverly Bone Brdige Pins to replace the plastic ones in my Martin 00028 EC. To my disappointment, the pins were too large to seat properly in the bridge. They appear to be of great quality but just will not fit without an unwanted modification. I know that I can easily return these but I will first try them with a different guitar. Beautiful pins that fit very well with zero mods and look splendid on my custom made Guitar Factory OM sized all Koa acoustic!!!!!! I also have a Ebony set on my Goodall!!! Both are excellent enhancements!!!!! These pins worked very well. I just pulled out the old pins and put in the new pins. I put these pins in a Gibson Acoustic guitar. It was not difficult at all, they worked great. The day we received the bridge pins the only thing we did was remove the six guitar strings and gently pull out the guitar strings. Noticing the pins fit kind of loose in the guitar bridge. My Dad and i slipped in the new pins. First we tried to put A/C silver foil on the pins to beef them up but that did not work. Next we tried painters masking tape to beef up the pins. That did not work either. Especially with the painters tape we could see when we attempted to tighten up one string, the pin would slide up and out. So like intelligent people we removed all the tape from the pins and strung up the guitar with strings. With the tuning of strings none of the bridge pins slide up and out. The pins fit nicely in my Gibson j 45 TV. Thank You Stewart MacDonald! I bought mine on Amazon, but supplied by StewMac. I did not see the slot spec and did not think to check. When I tried seating the 6th string, it was impossible because the nut was not able to seat against the bridge. Maybe this was a sign that the pin diameter is too large for my Martin 0-28? Anyhow, I'm not too happy about the $41 I paid. Martin pin is on the left in my photo. We're sorry our Waverly Bone Bridge Pins weren't the right fit for your guitar. Quality and 100% Total Satisfaction is our goal every day. If you are not satisfied you may return them for a refund or exchange. Please call us at 1-800-848-2273. We look forward to helping you with this. Everything I've ever purchased from Waverly has been top shelf. These bone pins with abalone inlay are no exception. They are beautiful and were a perfect fit in my Eastman E20. I highly recommend them. Stew Mac turn around was quick as usual. I love these bridge pins. They are classy and I always use therm with an ebony bridge. I'm convinced that enhance the sound of the instrument as well. Pins seem to be of good quality, but they are oversized. Too large in diameter to fit my Martin D-35 (or they have the wrong taper). In any case, they do not seat as they should. We're very sorry the Waverly Bone Bridge Pins weren't the right fit for your Martin D-35. Our guarantee is 100% satisfaction in every way. If a product doesn't meet your expectations, return it anytime for a refund or exchange. Our customer support team has decades of experience making customers happy.